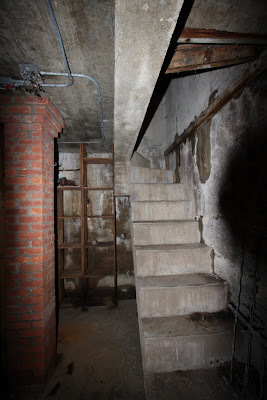 The wine cellar at Henry Carnegie Phipps' 'Spring Hill' estate in Old Westbury was an incredibly secure one, which leads me to believe they had incredibly expensive wine stored inside. 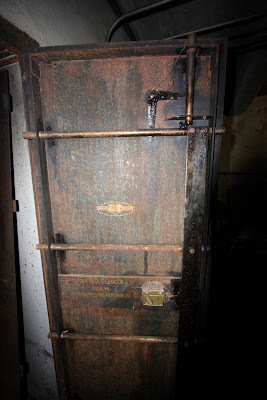 The windows are barred and the entrance to the cellar has this fairly thick safe door. 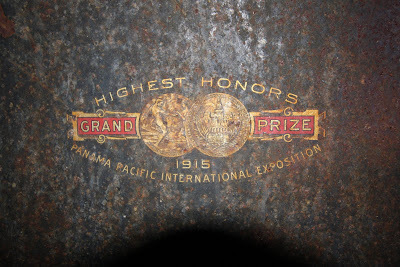 Made by the York Safe & Lock Company, they clearly won some sort of competition in 1915. 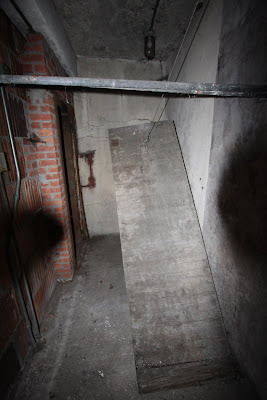 The wine cellar was hidden, and when this trap door (seen above) was lowered it would be very hard to tell that there was a staircase underneath it. 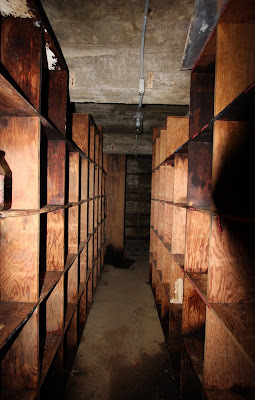 The wine cellar is pitch black now, shelves empty, but still looks as it did when the Phipps family lived above. Absolutely amazing; you are to be commended for doing this kind of research! hey Zach nice pics, hard to get in that darkness. When i was down there the only thing that kept nagging at me was if they had so much money then why are the shelves just boxes. None of the labels with dates were from before the late 1950's so chances are it looked different in the teens and '20s. There is a bricked up doorway which clearly led somewhere a long time ago.